The human experience is complex in the extreme. Sacred ritual is one way in which we resolve the complex perceptions, demands, and experiences of daily life, incorporate them into our personal understanding, and form a basis for continuing effective existence. Ritual takes place in a set-apart space and time in which we employ a rich set of symbols to represent crucial aspects of our life experience and then take action, manipulating those symbols to accomplish some important personal goals or meet our needs. The symbol set provides the connection between the complex world of daily existence and our personal worldview and understanding, establishing a consistency of impact and meaning. refresh ourselves for an orderly return to the macrocosm. Ritual depends on and makes use of the interconnectedness of all things –that each of us exists in and as part of the multitude of patterns, forces, flows, and actions of the Cosmos, so that actions and intentions in the context of the microcosm of ritual affect patterns, forces, flows, and actions in the macrocosm. it initiates change in the world in which that existence continues. 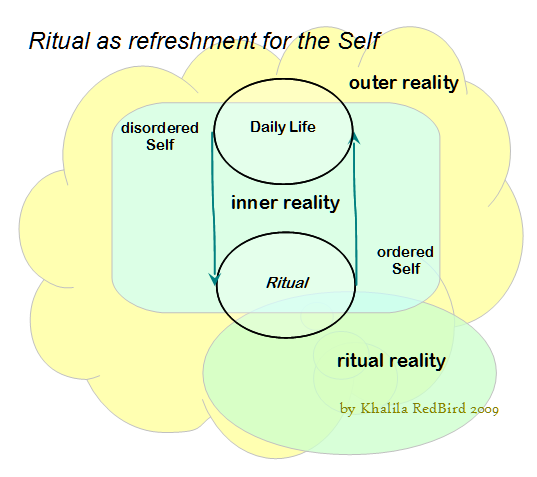 For technical background, please see the papers investigating ritual as a process for realigning the Self. I understand ritual as a process that mediates a transformation or change of state in each individual involved. In the spiritual domain, the ritual process occurs in a place and time set apart from our day-to-day reality. If only for a moment, a chosen set of assumptions and understandings interacts with our personal worldview on many levels, from critical consciousness to its deepest foundations. The liturgy of a ritual is designed to effect changes that remain when we return to day-to-day reality. In the Sacred Grove, I look to ritual to provide me a focused, guided way to enter the presence of the Lord and Lady — into the mystical and numinous experience of interaction with the Divine. The Grove and the trance journey by which we reach it have become a sheltering framework within which I can explore the infinite spiritual realm, with anchor points I can reach and grasp without looking for them. I am grateful to Wilddragon, the author of the Bhakti-Wiccan tradition, for encouraging me to extend it. When the ritual reality of the Sacred Grove became a spiritual home for me, after many trance journeys to the Grove, it became clear to me that there were more layers as yet unexplored than the imagery suggested. The initial spark for expansion, if I recall correctly, was a journey another Priestess and I led with a newly-acquainted couple. The preparatory elements affirm the presence of a Living Tree in the South, a great Sword in the East, a Cup in the West, and one or more Standing Stones in the North. The Sacred Grove itself is the home of the Lord and Lady, Whose presence is our ultimate goal. We left the Living Tree in our pathworking and arrived at the Sword, only to find that the woman with us was in great discomfort. We returned to ordinary reality to work our way through the dilemma with her. Two things emerged: the Sword had some painful associations for her that were not going to yield at the level at which we all were able to work together, and we developed a term for the situation where everyone else on a trance journey can see the Sword (or whatever) and you want to but can’t. It’s called trance envy. What is the Sword — any sword — but a tool that extends our reach, extends the capabilities of our hands, in particular one that separates one thing from another? It is a tool of discernment. The woman could approach the concept of the Sword by visualizing the Xacto knife she used in her daily work. While that did not trigger the discomfort, it did leave her with trance envy. On my own first encounter with the Sword, about 20 years ago, I really wanted to see a cool Excalibur-type sword of great import and meaning — and so forth. The vision wavered at first — and settled firmly into the battered sabre from my fencing bag, with which I practiced two to three nights a week and competed on weekends. Hardly romantic. But the Sword did have a message for me, and the quest kept me busy for the next several years.